The spring cocktail menu at Olana, a recently opened restaurant on Madison Avenue in Manhattan with an upscale American menu with Italian influences, provides guests with a choice of nine new libations, many of which feature fresh twists on classics – such as the Hudson Sidecar and the Vanilla Lemon Drop. These new drinks are the creations of Tom Lavin, mixologist at Olana. 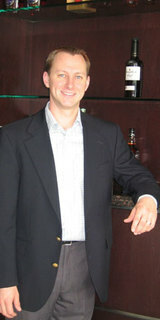 He uses rich ingredients and liquors in his cocktails, which he says matches the elegant and yet rustic ambiance of Olana. The place is named after American painter Frederic Edwin Church and decorated in the Hudson River School style. Lavin’s cocktails contain fresh ingredients, and he’s currently concocting fruit-infused brandies for his cocktails, such as apricot and pear, which sit in large glass vessels behind the bar. 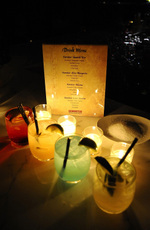 Lavin also works closely with Southern Wine & Spirits, which supplies many of the spirits on his eclectic menu. 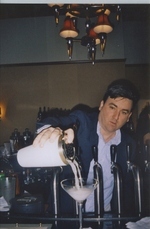 Lavin started his career as a bartender in 1992 at the bustling Edward Moran’s in Manhattan’s financial district, but says it was at the fine dining establishment Amanda’s in Hoboken, NJ, where he become creative with cocktails. Later, he spiced things up southwestern-style at the Shoreline Grill in Austin, TX, where he fashioned drinks such as the Gin Ginger Martini, using habanero pepper syrup. But through it all, Lavin maintains that the classic cocktails have the most staying power and are still the best. But he loves to give his classics a modern twist. His Corpse Riviver No. 2, for example, changes up the New Orleans classic with the recently launched Lucid Absinthe, instead of herbsaint; along with Plymouth Gin, Cointreau, the French aperitif wine Blond Lillet, and fresh lemon. 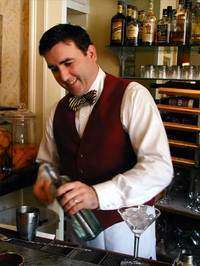 His greatest influences have been mixologists Dale DeGroff and Audrey Saunders. The Beverage Information Group (BIG): Please give me a brief synopsis of your background as a mixologist – where you’ve worked and how you honed your craft. Also, were there any mixologists that inspired you along the way? 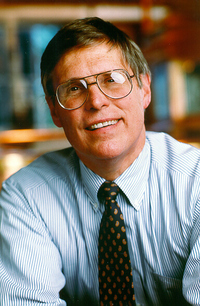 Tom Lavin: I started working full time in the restaurant business in 1992, after college, at Edward Moran's in the financial center in New York. That's where I met Bill Resk, one of the managing partners here at Olana. From Moran’s, I moved on to help Eugene Flinn open the expansion of Amanda’s Restaurant in Hoboken, NJ. It was there, in that fine dining atmosphere and with Eugene's help, that I started to become more creative with cocktails. After that I moved to Austin, TX, where I spent a little over two years at the Shoreline Grill creating drinks with a southwestern heat, such the Gin Ginger Martini with habanero syrup. However, Flinn called on me again after he purchased and agreed to restore the old classic, Cafe Elysian in Hoboken. I am still there on Friday nights because I love the place, in addition to my work at Olana. 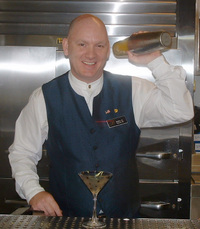 I am a big follower of Dale DeGroff and Audrey Saunders, two pioneers in mixology. BIG: How would you describe the new spring cocktail menu at Olana? Lavin: Since the opening was delayed a bit, the winter drink menu became a little outdated since we've moved quickly into spring. Allen Katz of Southern Wine & Spirits came aboard to help with the new spring menu and he brought along some of Southern's product such as Absolut Vanilia and Lucid Absinthe. The Absolut Vanilia is used in our Brooklyn Railyard, which also has pear liqueur, fresh lime, and Peychaud’s bitters. Pear flavor is also used in my Hudson Sidecar, which combines infused pear brandy with Cointreau, fresh lemon, Pernod and egg white. Another drink on our new menu, quite appropriate for spring and very on-trend, is the Strawberry Caipirinha, which shakes fresh strawberry with Agua Luca Cachaca and fresh lime. And our Baja Daisy is a mix of Sauza Hornitos Plata Tequila, fresh lime and oregat syrup. For something different, I did the Frizante Mojito, which adds Prosecco to the 7 year-aged Flor de Cana Rum, fresh mint and fresh lime. BIG: Food and cocktail pairings are becoming increasingly popular at restaurants these days. Can you recommend a pairing of one of the cocktails with a menu item at Olana? Lavin: When we did the cocktail menu we definitely wanted to compliment chef Al Dimeglio's menu. I wanted to use rich ingredients and dark liquors to match the feel of the restaurant: elegant and rustic at once. However, I don't think the trend of pairing cocktails with food will ever truly happen but matching each menu is still very important. Someone might enjoy an Apricot Cobbler -- made with homemade infused apricot brandy, Cointreau, fresh lemon juice and a dash of egg white -- before their meal and then see on the menu a Roasted Rabbit stuffed with almonds, apricots, and foie gras. BIG: You have an interesting drink on your menu, called Corpse Riviver No. 2, which is prepared with Lucid Absinthe. What was your inspiration in creating this drink? Now that absinthe is back, after being banned for nearly 100 years – what do you think the demand for it will be – is it the next big thing in cocktails or will it’s popularity be short-lived? Lavin: I believe in using the old classic recipes in mixology -- ones that have been around the longest are usually the best. You try and put a modern twist on them, as well. When Absinthe became legal last summer I wanted to do something with it at Olana. The Corpse Reviver No. 2 is a classic recipe from Arnaud's in New Orleans that I thought should be acknowledged again for its complexity. It used to be made with herbsaint but since Absinthe is now legal again, we've gone back to using that in the drink. The resurgence of Absinthe has leveled off a bit since it was first released but I think the demand for it will be steady as people learn that it is real and is now back on the market and it is an incredibly complex and delicious experience -- and it is a great ingredient to use with cocktails. BIG: Several of the drinks on your cocktail menu are prepared with infused spirits, for example, apricot-infused brandy. Please indicate what fruit infusions you’re currently working with. Also, there’s a trend today with infusions and fresh ingredients – What is the demand for then and are consumers generally willing to pay more for them? Lavin: Making your own infusions like a pear brandy for Olana’s Hudson Sidecar is a great way to custom create a flavorful complex cocktail. I've noticed in the past few years that the liquor companies have caught onto this and are marketing their own "infusions" like Absolut Pears Vodka. There is definitely a demand for cocktails with fresh ingredients. My cocktails all use fresh lemon or lime, where it’s called for. They bring about a uniqueness to a cocktail that consumers are absolutely willing to pay more for. One fresh drink for spring is the Pomegranate Sour, made with pomegranate juice, fresh lemon juice, simple syrup and Absolut Citron. BIG: What trends are you seeing today in mixology, and what are the most popular cocktails overall? There seems to be a vodka craze going on; is vodka the most asked for spirit? Lavin: Vodka has been the craze for awhile now and I don't see it waning. The biggest trend going is the continuing growth of flavored vodkas which provide something different for the vast array of people's taste. BIG: What is it that you enjoy most about bartending, and what is its greatest challenge? Lavin: The best thing about being a bartender is all the different people you encounter in a typical evening...the most challenging thing as a bartender is exactly the same as the best. The only way to survive and become a great bartender is you must have patience. The best ones all do. Washington State wine grew by 5 percent in 2007, with 8.6 million cases consumed – ranking it eighth in the nation, according to Beverage Information Group research. The latest entry to the state’s winemaking industry, Mercer Estates in Prosser – in March launches its first releases of four white wines – Pinot Gris, Chardonnay, Sauvignon Blanc and Riesling – with two red wines to follow next year (suggested retail for the portfolio is in the $15 to $24 range). This new winery is family owned and run by two of the best-known farming and wine grape growing families in Washington – the Mercer and Hogue families. Co-owners Mike Hogue and Bud Mercer say their main objective is to secure the best fruit from the Columbia Valley area and produce outstanding wines. The Hogue name is, of course, already well known on the national wine scene. Hogue Cellars, the second largest winery in Washington (grew 11.6 percent in 2007 to just under 500,000 cases), was sold in August 2001 and today is part of the Centerra Wine Company, a unit of Constellation Wines, the largest wine company in the U.S. by volume. 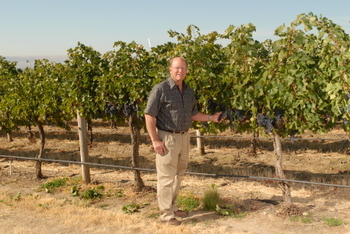 Mike Hogue continues to grow grapes for the winery that bears his name. The son of a hop farmer in the Columbia Valley, Hogue was first introduced to the wine industry in 1978 and learned firsthand from Walter Clore, a widely respected figure in the state’s winemaking business. Here, Hogue uncorks all the details of Mercer Estates, how it got started and how he plans to build awareness for the brand, and what’s special about the Columbia Valley’s vineyards. The Beverage Information Group (BIG): Mercer Estates launches its first white wine releases this month. But how did you get there – how long have you been thinking about operating a private winery? What influenced you to branch out on your own with Mercer Estates? Mike Hogue: I never really left the wine business because through the last five-plus years I have continued to be a grower for many other Washington wineries. The idea of a new winery came from my daughter Barb and son-in-law Ron, when they approached me about partnering with their friends, the Mercer family. I really enjoyed the challenge and journey of growing a brand. My past success has energized and encouraged me to see if I could do it again. BIG: What will be your role and major responsibilities at Mercer Estates, and what will be the responsibilities of your partner, Bud Mercer? 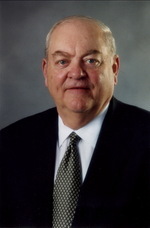 Hogue: Both Bud and me are going to be responsible for exactly the same thing we have always done – securing the best fruit. Through our family knowledge and relationships with the vineyard managers we are able to give David Forsyth (our wine maker) the best possible grapes to make the finest wine Washington has to offer. BIG: Upper Columbia Valley is certainly an up-and-coming wine region. What is it about this region that differentiates it or is distinctive, in terms of producing wine grapes? Hogue: With the Horse Heaven Hills appellation, its distinctive characteristics are south-facing slopes, well-drained silt loam soils, long warm days to ripen the grapes completed by cool evening and nights to preserve the grapes’ natural acidity for balanced wines, and the moderating influence of the Columbia River. BIG: How would you describe the Mercer Estates portfolio? Just wondering, are Mercer wines in a different price tier from Hogue – Mercer ranges from $15 to $25, suggested retail -- isn’t that generally more than Hogue’s prices? Hogue: In the beginning, we are going to make wines that showcase the best fruit from our estate vineyards. We are producing four whites – Pinot Gris, Chardonnay, Sauvignon Blanc and Riesling, and two reds – Cabernet Sauvignon and Merlot. The sourcing, hands-on approach and quantities are just three examples of how these wines will differ from anything Hogue has and currently produces. Concerning the pricing, that is true for some of the Hogue wines but not all. Remember that Hogue produces three different tiers of wine and some of those wines are actually higher priced than Mercer is going to be. BIG: The Mercer Estates white wines are being released in March, followed by the red varietals next year. Why the time lag in launching the reds and whites? How many bottles (or cases) of wine do you expect to produce this year; will that number be amped up next year – and next? Hogue: We are using some new vineyard sites and they are not yet producing wine-ready grapes. An example of this is the Dead Canyon Vineyard in Horse Heaven Hills, which was planted just a few years ago. These vineyards will be coming on-line over the next few years and our red wines will increase as this maturation process occurs. We have produced 15,000 total cases for sale in 2008. Yes, that number will go to about 28,000 cases next year. BIG: What is your strategy to distribute Mercer wines in the marketplace – both in the on- and off-premise markets? How do you plan to achieve brand recognition for Mercer on a national basis? Hogue: In 2008, we will be launching in six states around the country – Washington, New York, New Jersey, Georgia, Illinois, and Colorado. Because of our small production this year we will be focusing on restaurants, fine wine shops and some grocery channels in markets where applicable. We are planning to use any and all of the avenues that are opened to us including our website, tasting room, events, tastings, wine dinners and any and all festivals. BIG: And finally, regarding the wine industry in Washington today – as a veteran winemaker, what do you see as its greatest accomplishments and does it face any challenges? Hogue: Concerning Washington’s wine industry, we feel that our ability to make world class wines that have been recognized by all media channels in a very competitive and increasingly more difficult business environment has brought us our past success. Our greatest challenge is our greatest pleasure – that’s building awareness. Bill Samuels, Jr. is the seventh generation in a long line of bourbon makers – and his bourbon is Maker’s Mark. His father Bill Sr. started the brand in the mid-1950s, and the very first bottle was sold in 1958, featuring the iconic squarish shaped bottle dipped with red seal wax by his mother Margie in her kitchen. This small batch Kentucky straight bourbon was also unusual in that, unlike most, this bourbon is made from wheat instead of rye. The recipe was conceived by Bill Sr., and it remains unchanged today. But today, this bourbon brand is the fifth best-selling straight whiskey in the U.S., according to the Cheers On-Premise Handbook 2007. It rose from the pack of other straights in the late 1990s, and has achieved steady growth since then. In 2006, Maker’s Mark notched 666,000 9-liter cases. In 2007, it grew to 720,000 9-liter cases (preliminary figure) for an 8.1 percent increase. While this brand is clearly on the fast track, its president attributes hard work and “word of mouth” as the reasons for its growth. Indeed, the brand enjoys something of a cult status in certain circles. It is currently supplied by Beam Global Spirits & Wine. Here, Samuels discusses how the brand got started and grew, and he lauds the many friends and others who helped make the brand the success it is today, including Jim Beam, who he says was his godfather. The Beverage Information Group (BIG): Please give me an overview of your responsibilities as the President of Maker’s Mark Distillery. Bill Samuels: My responsibilities at Maker’s would be similar to any company CEO: 50 to 60 hours per week with about one-third of that time spent on the road and another 20-30 hours spent with community and charity responsibilities. If there is one area where I might be more engaged than other company CEOs, it is in the marketing of the brand. This is not because I have any particular skill or aptitude in this area but rather because when I came into the company over 30 years ago my father didn’t want me hanging around the distillery. He thought I might mess the whisky up! So my job was to “go find customers” and that’s pretty much the way it is today. BIG: Maker’s Mark is the fifth best selling straight whiskey in the U.S. today. What are the key factor(s) that enabled this small-batch brand to break from the pack to achieve this success? Samuels: If we are to lay a claim to whisky it is not in being America’s fifth best selling straight whisky. It would be for reinventing bourbon by being the first to bring good taste and understated sophistication to a dying spirits category (in the 1950’s when Maker’s was launched). Therefore, I would suggest that the key factor in our success was my father’s courage in taking this bold step back when no one in America was clamoring for a good tasting bourbon. Someone had to lead the way with being first. Dad took all the risk and I get all the credit. Not bad. BIG: Maker’s Mark uses a recipe of wheat, instead of rye. How was this recipe developed, why wheat rather than rye and how does that make the bourbon different? Samuels: Looking back this has always been my favorite part of the Maker’s Mark story and not just because the outcome was delicious and commercially successful, but rather about how it came to be. When my father decided to get back in the business in the early 1950’s (all of his forefathers dating back to the Revolutionary War had owned and operated bourbon distilleries in Kentucky) he reached out to his friends for help, not for financial backing as this was to be a very small venture, but rather for technical advice and counsel. For dad’s aspiration was to create the first bitter free bourbon, a bourbon that would be clean and crisp while finishing right at the tip of the tongue. The problem was – my father wasn’t sure how to do it. To the rescue came the likes of Lyons Brown of Brown-Forman, Ed Shapiro of Heaven Hill, Jerry Beam of Jim Beam, Hap Mottlowd of Jack Daniels and Pappy Van Winkle of Old Fitzgerald. Legends all and nicer men no industry has ever seen. I remember them all with great fondness. These are the men, dad’s friends and soon to be competitors, who helped him through the critical process of designing the product that would lead bourbon into its golden age. Has there ever been an industry with leaders that so unselfishly reached out to help a member in time of need like ours? I doubt it. And you know, the friendships among Kentucky’s bourbon distillers continues to this day. We think it’s a good thing. BIG: Back in the 1950’s, bourbon was solely men’s territory. But your mother, Margie Samuels, changed that and actually designed the bottle – the trademarked red wax dripping down the bottle, its squarish shape – even the name itself. Tell me a bit about your mom and what influenced her in creating all those distinctive bottle details. Samuels: Mom played a bigger role in helping dad “usher in the modern age of bourbon” than she ever gets credit for. Dad was so focused on what he was doing at the distillery, crafting this new taste in bourbon, that he gave very little attention to the all-important packaging and branding issues. As those first brands were reaching maturity, mom panicked by the lack of activity in this area and took over. Within six months she had created an icon and was headstrong enough not to let my father change a thing. Maker’s Mark was her first and last attempt at package design. Not bad for an amateur. BIG: The brand enjoys somewhat of a cult status in certain circles. For years it was marketed with the tag line, “It tastes expensive . . . and is.” How is Makers Mark being advertised today – who creates the ads, and what is the brand message you’re trying to convey today? Samuels: Pretty much all of our marketing (what there is of it) is focused on staying connected with brand fans, even the Maker’s advertising, which is targeted to friends. Our objective – to get a smile. We have a wonderful 35-year relationship with a Louisville, Ken. agency, Doe Anderson. They are an integral part of our team and as much as it kills me to admit it (since most folks think I’m the creative genius around here) it’s really Doe that does the heavy lifting. BIG: Please indicate who the Maker’s Mark customer is – do loyal consumers mostly skew male versus female (and also is bourbon attracting more women these days)? What about age group, mostly urban, suburban or rural, and what are the largest consumption regions in the U.S. for the brand? Samuels: Based on the mail we get, and we get a lot, I would have to say that those who are the most passionate about Maker’s tend to be a lot younger than me (I’m 68), well educated and living in or around metropolitan areas. Again, our mail would indicate that about 25% of our fans are women (we love it). And geographically, with the exception of Kentucky, which has always been Maker’s crazy, our brand is emerging pretty much simultaneously all across the country -- remember it is a pretty small brand. Brand recognition, awareness, quantitative distribution measures and other traditional success indicators have never been paid much attention to…since pushing our brand up there to the trade and onto consumers has not been a focus. We were simply too small, too underfunded and too stupid to pull it off. With us its always been about creating a product that “wowed” – allowing a few influencers to stumble onto it (fortunately, many bartenders did) and wait for conversations to begin. It really was that simple because we really did believe we had something worthy of being discovered. BIG: Which arena is more challenging in terms of brand recognition/acceptance -- retail liquor stores or restaurant/bar operations, and why? Also, how is Beam Global Spirits & Wine supporting the brand in these arenas since it became involved with Maker’s Mark? Samuels: Looking back over many years there can be no doubt that the greatest facilitators of this discovery were America’s restaurateurs, bartenders and package store owners. We have been so fortunate. For Beam Global, they have truly been a gift from heaven. They know bourbon, they have great respect for Makers and they tolerate me. What more could one ask for? And besides, the man Jim Beam has a very special place in my heart. He was my godfather. Spanish wines are on the move. In 2006, the U.S. imported nearly 12 million gallons of Spanish wine to the U.S. – for a 5.6% share of the total U.S. imported wine market – more than that of Portugal, Germany or Argentina, according to the Adams Wine Handbook 2007. But even so, many Americans are not aware of the diversity of Spanish wines available today. Spanish cavas, or white sparkling wines have been enjoyed by Americans for some time, and in fact, imports of Spanish sparkling wines accounted for 21% of the total U.S. imported sparkling wine/champagne market in 2006. Today, there are not only quality red wines coming from Spain, but there are also a spate of quality whites available as well. Getting the word out about Spanish wines in the U.S. is the job of Katrin Naelapaa, Director, Wines from Spain, a division of the Trade Commission of Spain, in New York. Naelapaa is a tireless supporter of Spanish wines, and became director in 2001, but she started in 1992 as its sales promotion manager. Here, Naelapaa details her interesting background and what led her to Spanish wines, what today’s best selling wines are and how to match up wines with food, as well as the events she has planned for this year. The Beverage Information Group (BIG): Your background consists of multi-cultural influences; tell us a bit about that. Also, what got you interested in Spanish wines, and how did you get involved in that industry? Katrin Naelapaa: To start with, I have an unusual last name: it’s Estonian, both of my parents are Estonian and I’ve kept it even though I’m married and I speak the language, too. I was born in the U.S., but when I was in the first grade, we moved to Mexico City where I learned Spanish. I went to Georgetown University in Washington, and I also studied in Spain. I have always been interested in food and wine, am an avid cook and did a lot of entertaining while I was a corporate banker. I started to learn more about wine through wine tastings, took a wine course at Windows of the World and did a six-week stint in sales during a holiday season at Morrell Wine Merchants in New York to learn more. I knew I wanted to work in wine, but wasn’t sure where. I pursued the Wines from Spain. 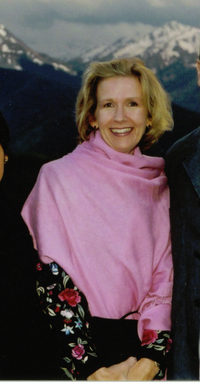 I was in the right place at the right time and was hired as a sales promotion manager in 1992. BIG: Please give me an overview of your responsibilities as the Director of Wines from Spain in the U.S.
Naelapaa: As the director, a position I have held since 2001, I am responsible for overseeing all programs that are promotional, advertising, public relations, or marketing related for Spanish wines in the U.S. I also advise quality wineries in Spain on bringing their products here and help them find importers. BIG: Can you provide a few more details on the Spanish Wine Cellar and Pantry, the largest showcase event for Spanish wineries and food producers seeking importers, distributors and trade representatives in the U.S. Also, tell me a bit about some of the other promotional events you have planned for this year. Naelapaa: In its third year, the Spanish Wine Cellar and Pantry will be held in April in San Francisco and in New York. In New York, we’ll have about 50 wineries represented, and demand is far greater than space -- we could easily have 100 producers. We’ll also have roughly 20 producers from the food component. With the wines, producers have to meet certain criteria to participate – an English speaking representative is required, they must have an export department, and there are minimum prices, too. We’re not looking for bulk wine shippers; wines have to be $7 suggested retail and up. However, with the Euro’s impact, our best calling card is no longer the $5 to $10 range – it is going to be in the $12 to $30 range. Also, we are in the 15th year of the Great Match tasting event. This is generally done in from four to six cities, from the late spring to October. This event is historically done with all types of cuisines, and we’ll match our wines with various Asian, Mexican, and of course Spanish dishes. We’ll also sponsor the Aspen Food & Wine event this year and we do regional wine events as well. BIG: Spanish wines are traditionally paired with tapas. Beyond tapas, what other foods or dishes pair up nicely with these wines? Naelapaa: Because of their diversity, Spanish wines pair well with a variety of foods. But any of the cuisines of the Mediterranean pair particularly well with Spanish wines. Foods from Italy and southern France and other Med countries have so many dishes that are garlic-based, contain a lot of vegetables, and also have a lot of fish, lamb and pork. They are flavorful, but not spicy; spicy foods are generally a bit harder to match with wines. Also, good matches can be made with Asian cuisines. BIG: Has the demand for Spanish wines in the U.S. increased in recent years? What are the best-selling Spanish wines today (i.e. red or white, varietals, regions)? Naelapaa: I’ve had the benefit of seeing Spanish wines evolve in the U.S. over many years. Spanish wines have achieved double-digit growth in the U.S. over the last eight years. These wines have grown by 15% in volume each year. Miami and New York are fixed markets for Spanish wines, and our largest sales markets. Tempranillo is the backbone of Spanish red wines. It is a varietal from the Rioja and Ribera del Duero regions. It is a grape with all the characteristics to make a great wine – a good nose, good structure, and good acidity. And it’s not overly alcoholic – most are 13% ABV. When I started in the 1990’s, Spain was not known for its white wines but that has changed. Today the calling card for white wines is the Albarino, produced in the northwest region of Rias Baixas. It is an aromatic grape, perhaps a cross between an Alsace Riesling and a French Sauvignon Blanc. It is a high quality wine that’s readily available at retail stores at approximately $11 or $12 per bottle. Also, people can remember the name as it is not difficult to pronounce! While the top-selling wine is Albarino, a second popular white is Verdejo, a varietal from Rueda. BIG: What would surprise people, or what about Spanish wines may not be generally known? Are there any trends you’re seeing in the Spanish wine market now? Naelapaa: People are always surprised by the diversity of Spanish wines. 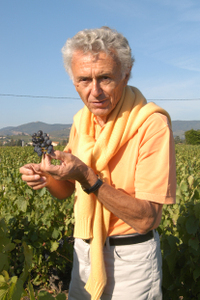 The country offers the big, deep inky red wines to white wines. Also, people may have preconceived ideas about Spain, but it is making quality wines today. Spain is a virtual vineyard, and a trend that is emerging is that winemakers are finding great pockets of “old vineyards” to make their wines. With these old vines, the yields are lower but the quality is better. Also, although wines are generally labeled by region, there’s more varietal labeling today. In addition to the popular Albarino, Monastrell and Grenache grapes can be seen on labels. This will help consumers in the long-run, as they are so familiar with varietal labeling here in the U.S.
BIG: If a restaurateur would like to add Spanish wines to his or her wine list – what would be a good place to start and what are some of your recommendations? Naelapaa: Firstly, I see many restaurants carrying Spanish wines at $100 or $150 a bottle – and that’s too bad because Spain’s greatest advantage is that it offers wonderful wines at prices lower than that. Wines in the $15 to $20 suggested retail price range can translate to wine lists at $30 to $60 and they are quality wines. For recommendations, I would start with Albarino wines – these have good mouthfeel and guests used to chardonnay would enjoy these wines. And, add Tempranillo bottles, as these can marry with a range of foods. Also, the alcohol level of these is less than 14% or 15%. When wines are so highly alcoholic, people can’t drink much more than one glass. With the Tempranillo, guests can order a bottle, and maybe a second so in this way operators can potentially see wine sales increase. I’d also recommend adding a Grand Reserva from northern Spain to lists, from 2000, which was an outstanding year, or 2001. Boening Brothers, Inc. and Oak Beverages, Inc. comprise the Boening organization, a beer wholesale distributor serving the metropolitan New York area market. The distributors are recognized for their focus on customer relations and brand building across all markets including restaurants, bars, hotels and supermarkets. The fourth-generation family business began in 1901 by Philip Boening and today, his grandson Hap, presides as president of Boening Brothers, a post he has held since the 1960’s. Here, he discusses the beer wholesale distributor business in New York and offers insights into where the beer market is heading. The Beverage Information Group (BIG): You became president of Boening Brothers several decades ago. What are your current responsibilities and main focus at the company today? Hap Boening: My current responsibilities as president are many-fold. However, one important area is keeping company personnel abreast of changes in our business and how they can use these changes in a productive way. We’re living in a time of change in terms of the many beers sold today—flavored, craft, seasonals, and so on. BIG: Boening Brothers and Oak Beverages are well-established family businesses. What do you feel is the greatest strength in a family business, as well as the biggest challenge? Boening: It can be fun and enjoyable to work with family, and we get to share the rewards. My son is the vice president here at Boening Brothers, and my daughter is the president of my other company, Oak Beverages. But I also have two daughters who are not in the business. As far as challenges, there can be one in terms of continuity. By that I mean, you want the right people in the right places—whether they’re family or not. It’s a business, and everyone is expected to cut the mustard, or they can’t be in that position. In dealing with all employees, setting a good example and being honest are key. BIG: Given your vast experience as a beer wholesale distributor, please indicate in what ways you’ve seen the business change or evolve over the last couple of decades or so. Boening: The brands we have from brewers now, including flavors, crafts, and seasonals, were not the norm 20 years ago. Back then, we didn’t have apricot beer. You need to think the unthinkable in terms of beverage consumption! What’s changed is the length of the portfolio of beers. Twenty-five years ago there was Bud, Bud Light and Michelob. Today there are many new brands such as Dogfish Head, Magic Hat, etc., and you have major companies producing smaller, boutique beers. The consolidation of suppliers has been a big change. BIG: Can consumers handle all the new brands out there--is there really market demand for them? Boening: Consumers are more fickle today. Many are looking for something different all of the time. People are going out to eat more frequently in the New York area, and eating a greater variety of cuisines, and this has influenced the beer they drink. For example, if I’m at an Italian restaurant, I want a Peroni, or if I’m at a Chinese restaurant, I’ll try a Tsingtao. Rather than paying four dollars for a Bud, people don’t mind paying an extra dollar for the Peroni, to tie their beer into what they’re eating. There’s also been a huge change in the way beer is consumed, compared to 25 years ago. Back then, we’d see working men drinking beer at lunchtime. Beer is not consumed that way anymore—it’s more likely to be enjoyed after a softball game or after a game of golf back at the clubhouse. So athletics play some role with beer today. BIG: What is it like working in the New York metropolitan area market and what challenges does it present to your business? Boening: The beer business is a very local business. In New York, we have Spanish, Portuguese, French, Irish, to name a few—and you have to gear your marketing to these groups with promotions and brand building. And there are no Wal-Marts in the city; the urban business is small-sized. It’s difficult to deliver in the city too—parking is tough. Then you have to carry the beer in boxes down stairs leading to basements. Also, the state of New York has stringent alcohol beverage control rules and container laws. We have to take back all the empties, crush the glass and aluminum. BIG: But hasn’t technology made your business easier, in some ways? Boening: Yes, it has. For example, our delivery drivers use two-way communication devices in their trucks, that way drivers get answers to any problem that arises in an instant. Equipment has improved, too, as has the weight of cartons—they’re lighter now. Our salespeople use hand-held computers to communicate with customers and track product. Computer technology has made payments and electronic transfers easier. BIG: How do you respond to the overall beer market being flat? And are there any hot trends you’re seeing now? Boening: Although beer has leveled off, it will continue to grow and thrive. Spirits have diminished a bit, too, while wine has grown. And just as you’re seeing with spirits, people will likely drink a bit less but better beer in the future. Instead of three Buds, they’ll have two imported beers, for example. As far as trends go, as I mentioned, craft and flavored beers will continue to grow. And this summer, we had a lot of success in our Long Island markets with Miller Chill, a light beer with lime and salt added. Long before the emergence of today’s popular spirits, such as vodka and rum, Canadian whisky held a prominent place in the distilled spirits industry. The category claims a share of a bit more than a third of all whisky sales in the U.S. and 61.5 percent of imported whisky sales here. Most Canadians are blended, multi-grain whiskies with great mixability. Therefore, they are quite relevant to today’s cocktail culture. But despite its unique flavor profile, Canadian whisky sales overall have remained virtually flat since 2000. And in 2006, the category inched up by just 0.3 percent. Unlike other “hotter” spirits today, a major factor in Canadian whisky’s flat growth has been a sharp decline in advertising outlays over the last few years. But Canadian Club Whisky, which is celebrating its 150th anniversary this year, is changing that. The brand, which is supplied by Beam Global Spirits & Wine, has launched its first multi-layered national ad campaign in nearly 20 years. Aimed at males younger than the traditional over-40 Canadian whisky consumer group, the “Damn Right Your Dad Drank It” campaign features masculine imagery from the 1960s and ’70s. 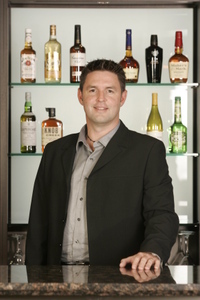 Mike Ginal explains his responsibilities as Canada Club’s brand manager, provides his perspective on how Canadian whisky can increase sales, and fills us in on the strategy behind Canadian Club’s provocative “Damn Right” campaign. The Beverage Information Group (BIG): The marking of Canadian Club's 150th anniversary this year shows the great longevity of Canadian whisky and the Canadian Club brand in particular. Begun in 1858 by Hiram Walker in Ontario, the brand has survived milestones, including Prohibition, when one of its best customers was Al Capone. What is it about this brand that has enabled it to thrive for 150 years? How has this product changed over the years, and in what ways has it stayed the same as today? Mike Ginal: First and foremost, Canadian Club's success and longevity can be attributed to the quality of the product inside the bottle. CC, unlike most competitors, is blended before aging, which allows the distillates to marry during the aging process--ultimately creating a smoother and more sophisticated flavor. It's this uniquely smooth taste profile which has allowed Canadian Club to endure through all of the different trends and fads over the years because consumers have always appreciated--and continue to appreciate--the taste of a classic cocktail. This was true for those Prohibition rumrunners, but also for today's consumers who are looking for a classic, great tasting drink. Fortunately, the CC recipe and production process have not changed during the brand's 150 year history. In addition to the product itself, Canadian Club has run some of the most successful consumer campaigns and trade programs in the history of the spirits industry, from the Hide-A-Case consumer campaign of the 1960s and '70s to our famed sales program, Canadian Club Society, which enters its 45th consecutive year in 2008 and continues to be one of the most prestigious sales programs in the spirits industry. BIG: What are you responsible for as brand manager of Canadian Club Whisky? Ginal: Beam Global’s vision is “building brands people want to talk about.” As Brand Manager of Canadian Club, my job is to make legal purchase age consumers want to talk about CC. Specifically, this means that I am responsible for developing and implementing marketing strategies and activities for Canadian Club in the U.S. And 2007 has been an incredible year for the brand. We announced the launch of “Damn Right Your Dad Drank It,” the first national multi-layered advertising campaign for the brand in nearly 20 years. The national consumer print advertising, which began in November, lays the foundation for the brand idea. But it’s the other activities that we’re doing on-premise and through other non-traditional means which are truly going to bring the brand to life--and get people talking about Canadian Club. BIG: Canadian whisky does not have the wide consumer recognition of other spirits, such as vodka, yet whisky has a longer history and tradition. Why is this so? 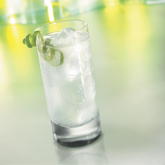 Ginal: The vodka category has experienced tremendous growth over the last decade. The introduction of flavored vodkas and super-premium brands led to the vodka cocktail trend. One of the things that people like about vodka is that it is easy to mix when making cocktails. We’re seeing a clear resurgence in whisky-based, classic cocktails, however. We believe that Canadian Club is the perfect whisky for making classic, masculine cocktails because of its uniquely smooth and sophisticated flavor. The challenge with Canadian Club and other Canadian whiskies is that there hasn’t been much spending in the category recently. 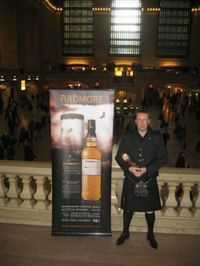 With CC’s significantly increased spending levels and multi-layered “Damn Right Your Dad Drank It” campaign coming to life in 2008, we expect to increase consumers’ awareness and affinity levels for both the brand and classic whisky cocktails. BIG: How much of a resurgence has brown spirits has lately in cocktails? Ginal: While no category has been able to maintain pace with the growth of the largest spirits category over the past decade, vodka, we definitely are seeing a resurgence in the brown spirits category. Mixologists and consumers alike are rediscovering the beauty of a classic, masculine cocktail--and that’s where whisky, especially Canadian Club Whisky, comes in. Drinks like the Manhattan, Whisky Sour and CC & Ginger are returning to the forefront. We expect to see this restoration of classic style and masculinity, in terms of drink choice, continuing. BIG: Canadian Club’s campaign, “Damn Right Your Dad Drank It,” is getting a lot of buzz. It targets men, 30-40 years old, features candid imagery from the 1960s and ’70s, and has ad copy such as “Your Mom Wasn’t Your Dad’s First” and “Your Dad Was Not a Metrosexual.” How do you respond to those who may find those ads a bit old-fashioned or even slightly offensive? Ginal: Beam Global is committed to complying with the highest standards of marketing and advertising practices. We believe that “Damn Right Your Dad Drank It” embodies Beam Global’s vision of building brands people want to talk about. The print ads’ imagery is breakthrough and engaging, and the headlines are provocative. They induce a visceral response, and that’s what we love about them. It’s clear--through the numerous blogs and articles that have been written about the campaign--that Canadian Club has sparked a broader conversation about the notion of timeless masculinity. BIG: How did the “Damn Right” campaign come about; who created the concept? Ginal: In May, 2007, we hired Energy BBDO to help us reposition Canadian Club in an effort to increase relevance and trial with our target audience. Going into the planning process, we knew that in order for Canadian Club to stand out, we needed to be bold and breakthrough--and this was paramount during the concept phase. Energy BBDO helped us to come up with a creative, inspiring solution which capitalizes on Canadian Club’s long and rich history by celebrating generations of CC consumers. “Damn Right Your Dad Drank It” signifies a vital shift for Canadian Club, and we are excited about the prospects for profitable growth. BIG: Can you pair Canadian whisky with food, or is it best enjoyed solo? Ginal: Canadian Club is a sophisticated yet unpretentious drink. It makes a wonderful classic cocktail that can be enjoyed on its own or paired with a meal. Canadian whisky cocktails like a CC and Ginger or Manhattan are timeless and showcase the smooth and sophisticated taste of Canadian Club. My favorite is pairing a CC Manhattan with a great salmon dish. But, there are many other ways to pair Canadian whiskies with food.